Thank you everyone for all of the comments, snaps, messages, etc. wishing me luck! Thank you to my coach, to the meet directors, the volunteers, the judges, my friends, & family and everyone who made the day so much fun! 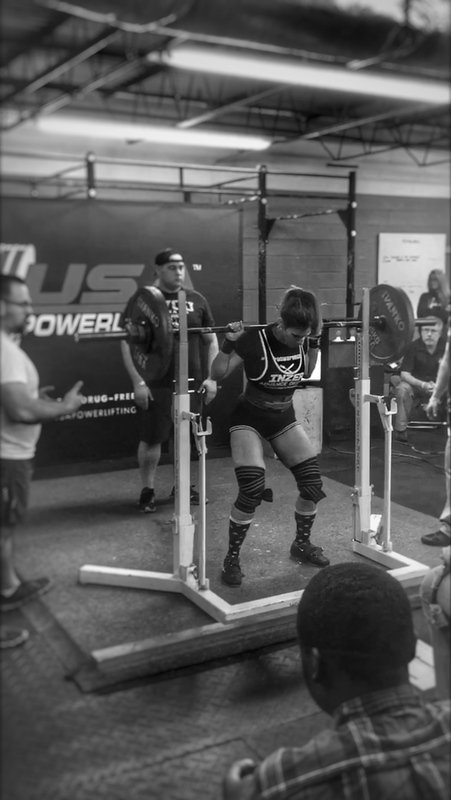 I’ve been trying to write this powerlifting meet recap for days now. I’ve drafted a play-by-play of the day, a “10 things I learned from my first meet” type piece, and a combination of the two. But none of them seem quite right. So we’re just gonna wing it. Previously, I had never really had an interest in competing in powerlifting - I’m a terrible bencher, my deadlift is laughable, and my squat is just okay. Powerlifting meets are insanely long and, honestly, kinda boring. And then there are singlets. Add to that the fact that I get really nervous when lots of people watch me lift, so the prospect of lifting on a platform in front of an audience is a liiiiittle scary. Basically, powerlifting has never really on my list of sports to compete in. Standing on a platform and lifting in front of everyone is a very different experience than being on a strongman competition floor. Don’t get me wrong, strongman is grueling and tough...but at this point, it’s a little familiar. That is a great thing because it means I can challenge myself in lots of ways in that sport. But honestly, I felt myself getting a little complacent. Enter being talked into doing a powerlifting meet. Training was hard. REALLY hard. It was also fun and I made A LOT of progress but there were definitely days when it was 10pm at night and I was just finishing up my workout. Or I would look at my program and think “Wait, I have to do what? !” (Thanks to my coach Annie Gunshow for believing in my abilities, you the real MVP). As the meet got closer, and my brain became mush as I was peaking, and my quads and lats experienced feelings of near death, I was just so ready to be done. I was tired, sore, and mentally exhausted. As I was trying to (unsuccessfully) sweat off some weight on Friday night and going through my mental checklist for the next day, I started to get nervous. I had my usual thoughts of “What if I totally bomb? What if I forget how to do everything?” While I logically know that it is highly unlikely that I am going to forget how to squat, I did have some doubts in my abilities to put up any weight, let alone my planned opener weights. At the heart of it all, I was really nervous that I would not be able to do this new, hard thing. I didn’t make weight. I weighed in at 63.8kg (.8kg over) despite cutting weight pretty hard. I cut as a trial run for my strongman season and I’m glad I did, lots of lessons learned and changes that will be made. Since I didn’t make weight, I lifted as a 72kg equipped (I used wraps) open lifter. I went 7/9 with a ~640# total. Squat: 120kg/265#; Bench: 45kg/99#; Deadlift: 125kg/275# My squat and deadlift tie my gym PRs. After weigh ins, I told myself that I was just going to go into the day with a good attitude and try to work on being a better competitor. I just really wanted to see my work pay off on the platform. I often underperform so much in a competition setting because I can’t get my head together and I really wanted this time to be different. And despite my nerves, this is one of the first times, ever, that I have walked up to any competitive platform with confidence. I actually trusted in my own abilities to perform and I trusted the process. It was one of those days when all of the hours and hours of sweat, blood, and tears (quite literally) paid off. Even though I didn’t PR anything, I couldn’t help but be so excited after my third deadlift that I basically jumped up and down and hugged everyone. Coming into this meet, I wasn’t really sure what my goal was. Yes, I wanted to put up a total and have fun but it wasn’t until I was sitting around waiting for my third deadlift attempt that I actually figured out why I wanted to do this meet. As I was sitting on a chair with headphones in, covered in baby powder and chalk, listening to some horribly dirty rap music with my head down, it suddenly occurred to me that this meet was not about squatting or benching or deadlifting. It wasn’t about PRs. It was about being challenged and being a little afraid but doing it anyways. But mostly, I was about reminding myself that I can do hard things. And snacks. It may have been about the snacks, too.